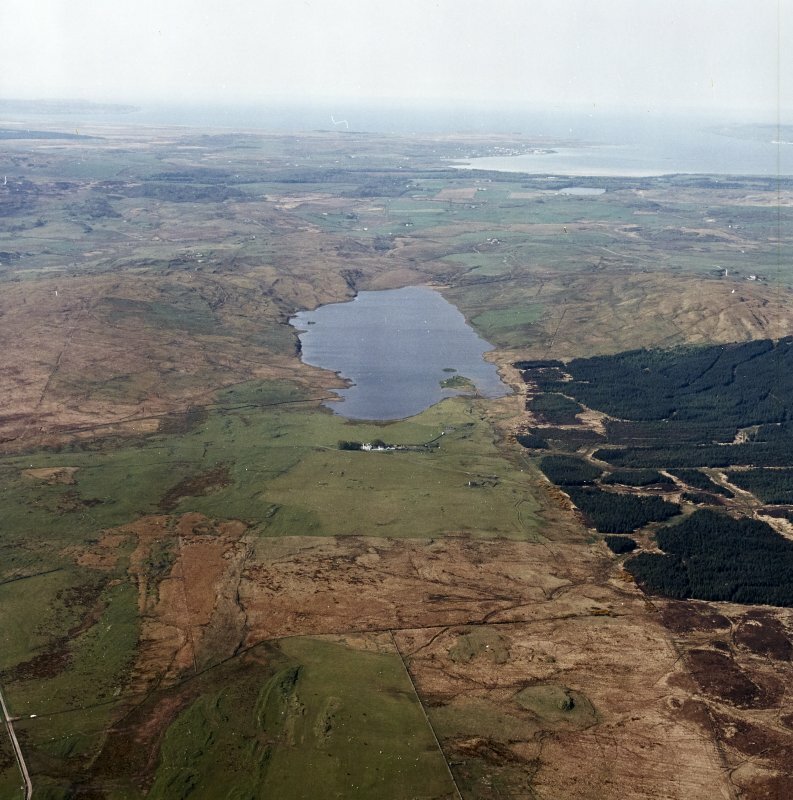 General oblique aerial view looking across the farmsteading towards Loch Finlaggan and the remains of the burial-ground, chapel, castle and island dwelling with Bowmore and Loch Indaal beyond, taken from the ENE. Filaggan, Islay. 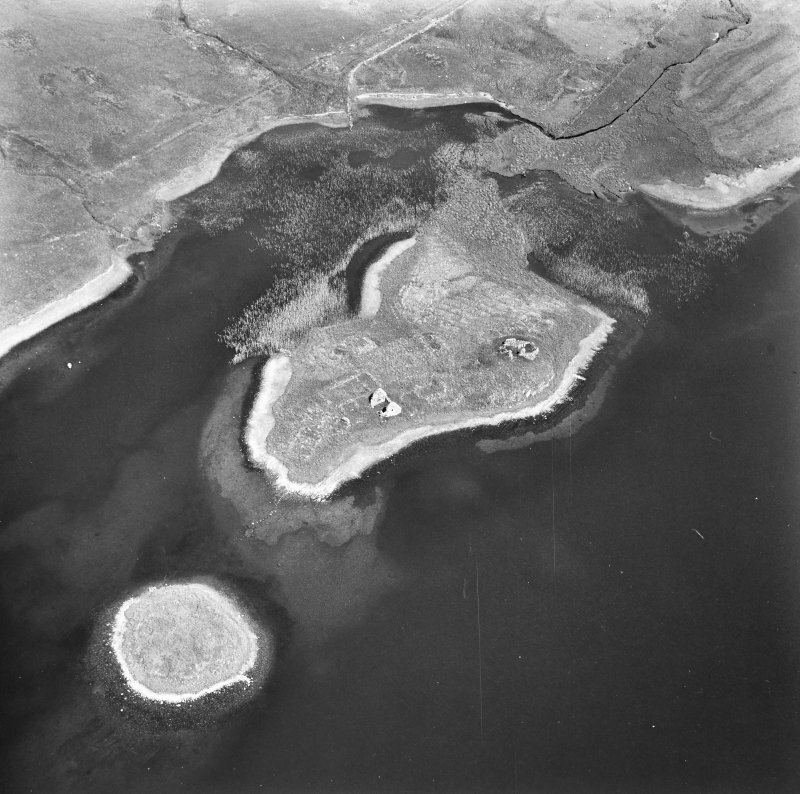 Oblique aerial view of Eilean Mor and Eilean na Comhairle from South. Finlaggan, Islay. Aerial view of Eilean Mor and Eilean na Comhairle from South West. Filaggan, Islay. Aerial view of Eilean Mor and Eilean na Comhairle from North East. 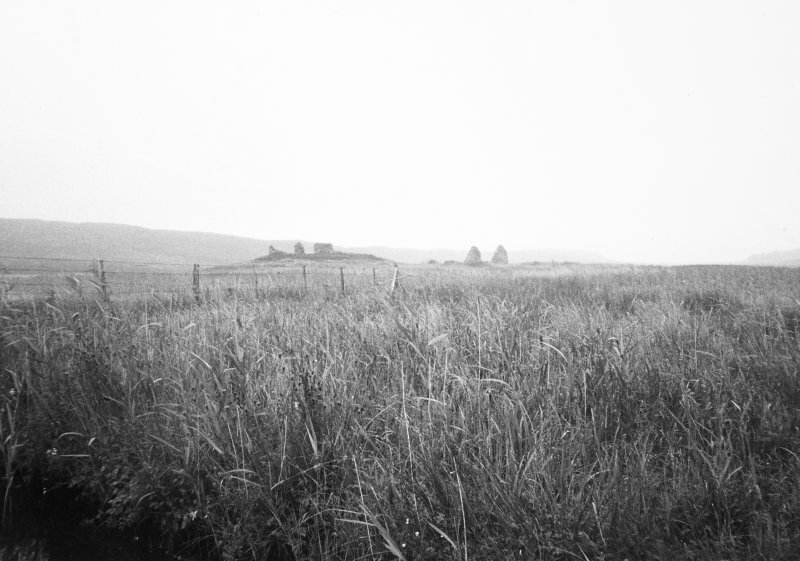 Kilfin Laggan Chapel and Finlaggan Castle, Eilean Mor, Loch Finlaggan. General view. 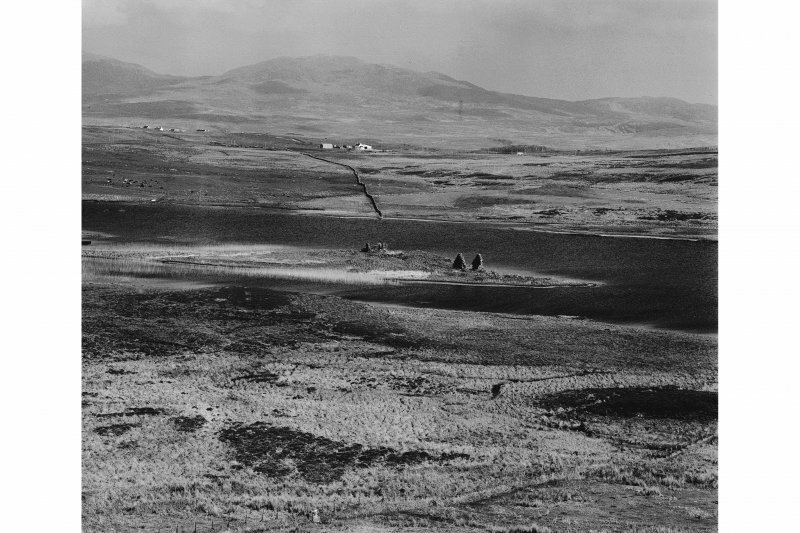 Oblique aerial view centred on the remains of the burial-ground, chapel and castle, taken from the W.
Finlaggan Castle, Islay. 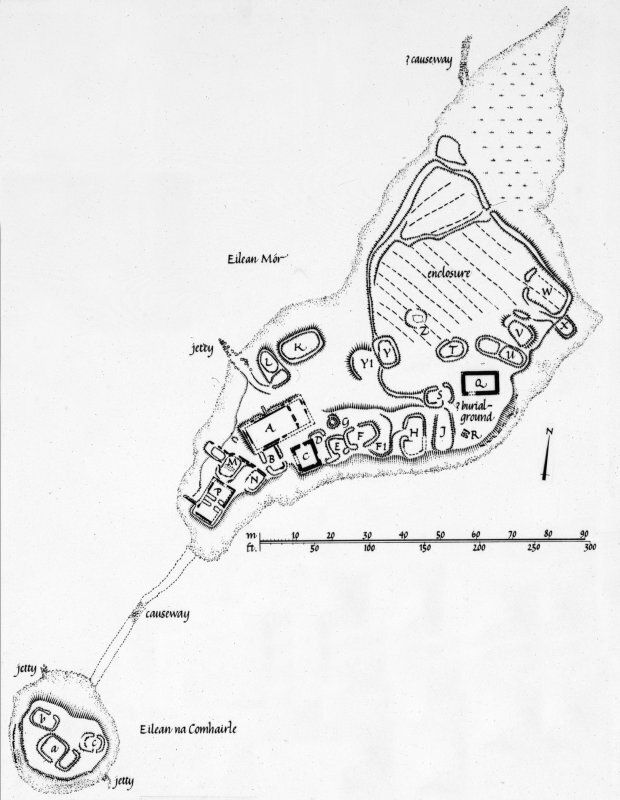 Photographic copy of plan of castle and chapel on Eilean Mor and Eilean na Comhairle. Footprint, Finlaggan, Islay. 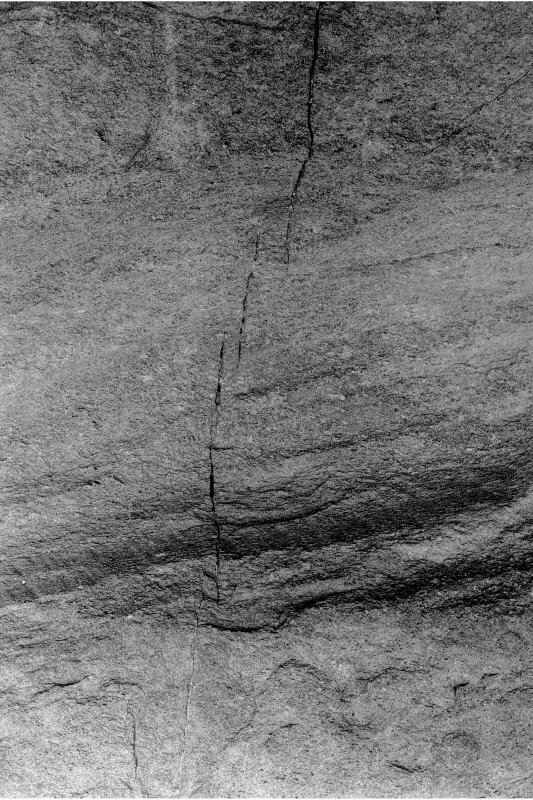 Detail of crack in alleged footprint on reverse of West Highland Stone. General oblique aerial view looking across the remains of the lead mines, engine house and the farmsteading towards Loch Finlaggan and the remains of the burial-ground, chapel, castle and island dwelling with Bowmore and Loch Indaal beyond, taken from the ENE. Oblique aerial view of Eilean Mor, Eilean Na Comhairle and Finlaggan Castle, looking SW.
Finlaggan, Islay. Aerial view of Eilean Mor and Eilean na Comhairle from North. 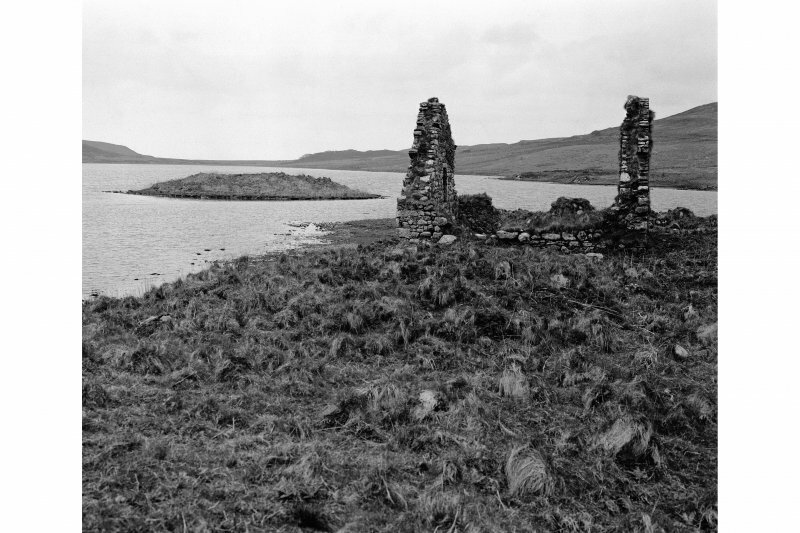 Finlaggan Castle, Islay. View of West Highland Stone. 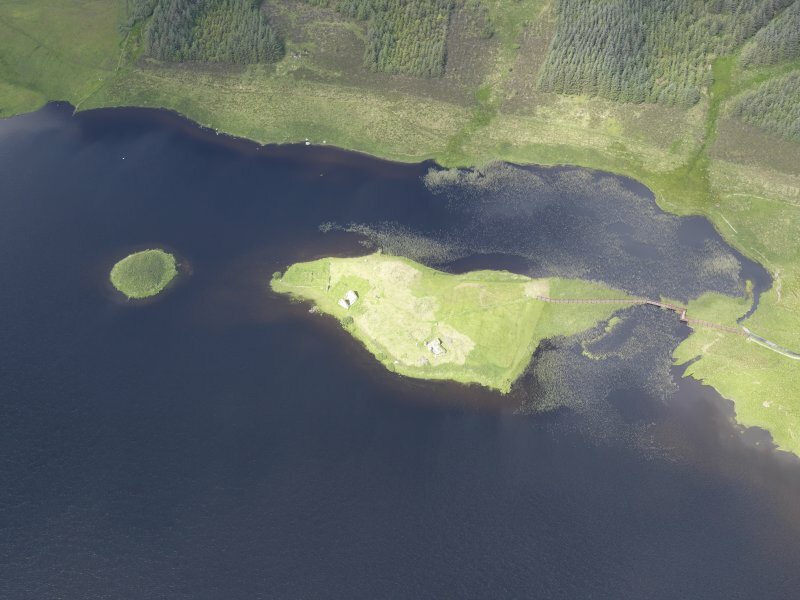 Oblique aerial view of Eilean Mor, Eilean Na Comhairle and Finlaggan Castle, looking SSW. 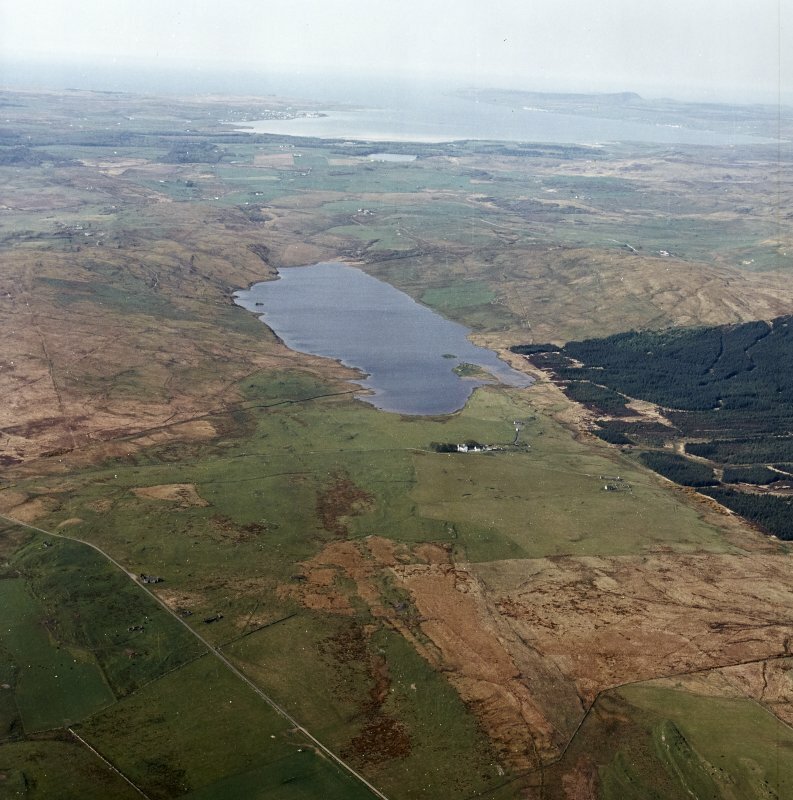 Oblique aerial view of Eilean Mor, Eilean Na Comhairle and Finlaggan Castle, looking W.
Finlaggan Castle, Islay. View of fragment of West Highland Stone. Oblique aerial view centred on the remains of the burial-ground, chapel and castle, taken from the SW.
Finlaggan Castle, Islay. General view from West. Oblique aerial view centred on the remains of the burial-ground, chapel and castle, taken from the SSE. 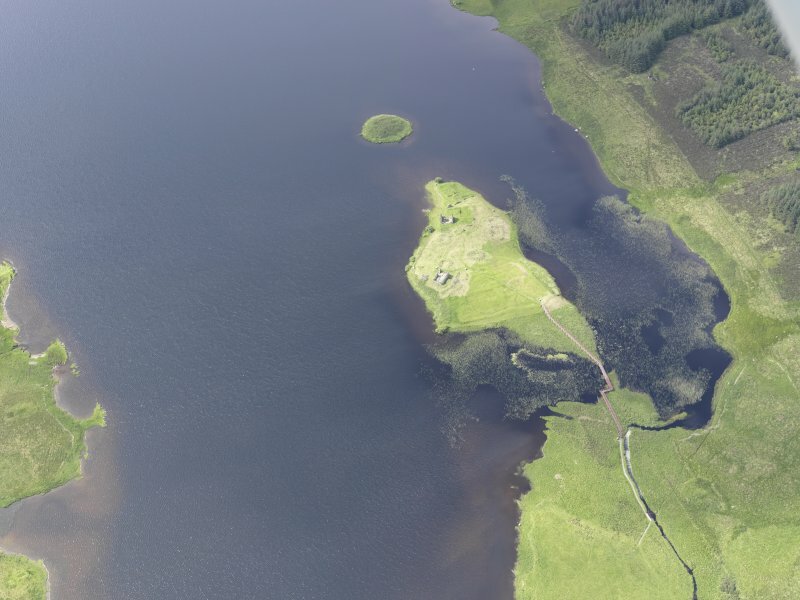 Oblique aerial view of Eilean Mor, Eilean Na Comhairle and Finlaggan Castle, looking NE. 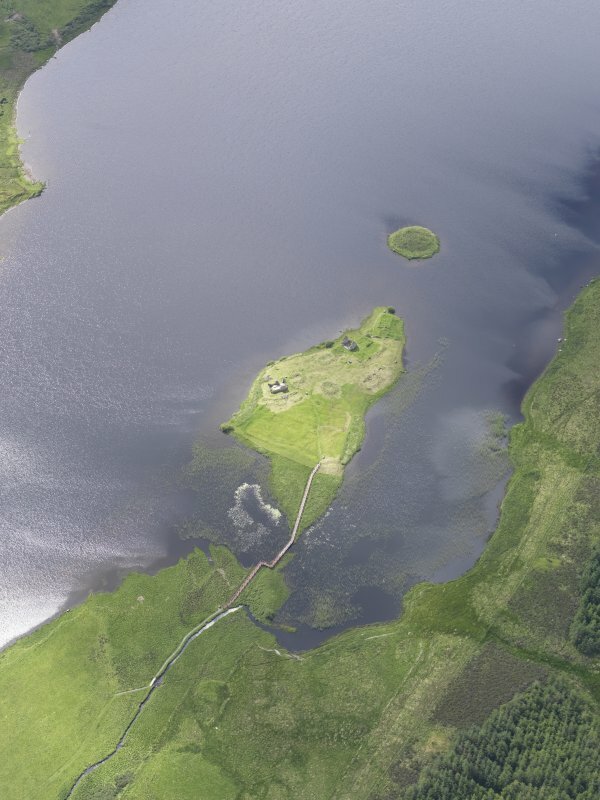 Oblique aerial view of Eilean Mor, Eilean Na Comhairle and Finlaggan Castle, looking NW. Finlaggan Castle, Islay. 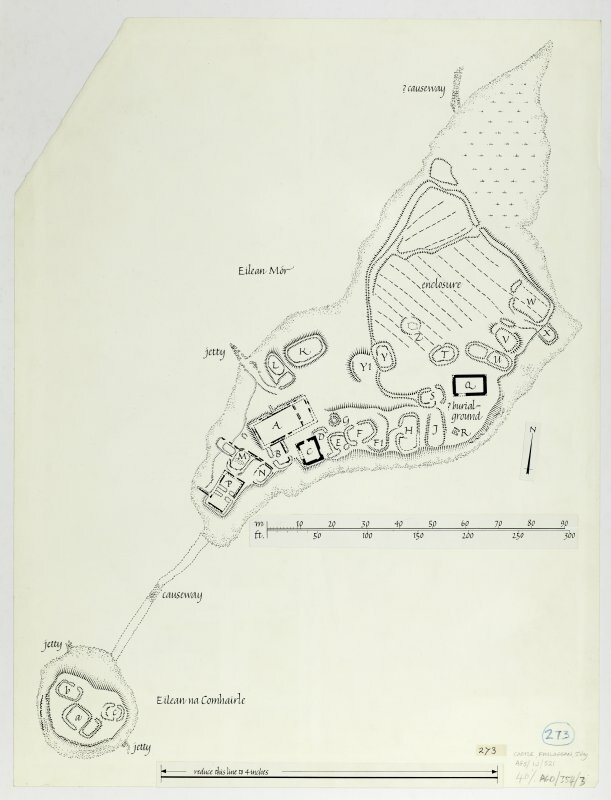 Photographic copy of survey drawing of plan of castle, chapel and Eilean na Comhairle. 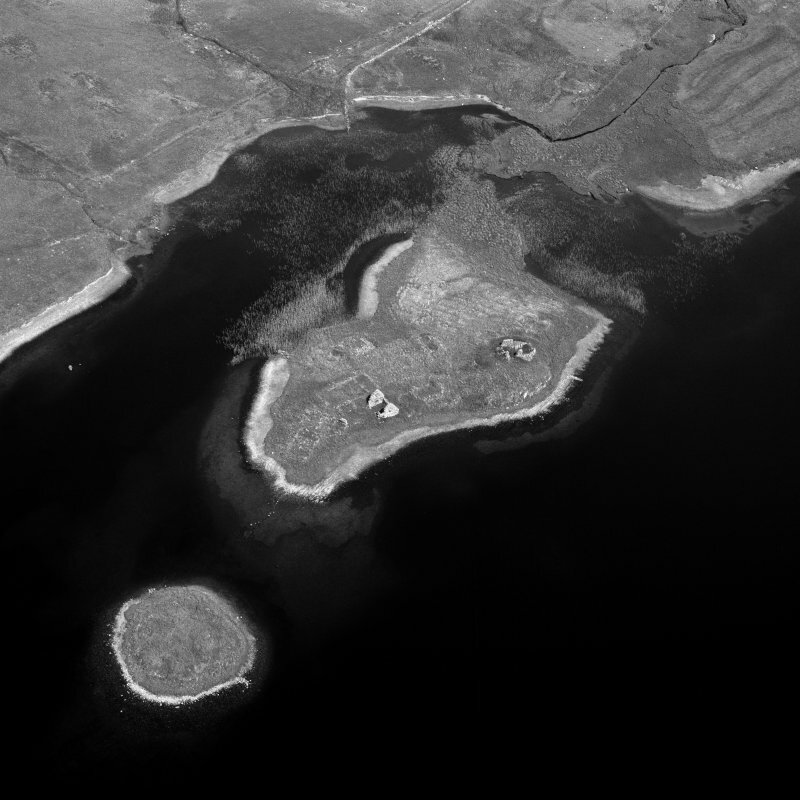 Oblique aerial view of Eilean Mor, Eilean Na Comhairle and Finlaggan Castle, looking S.
Finlaggan Castle, Islay. View of Building C and Eilean na Comhairle. Finlaggan Castle, Islay. View of building C (provisional). Finlaggan Castle, Islay. 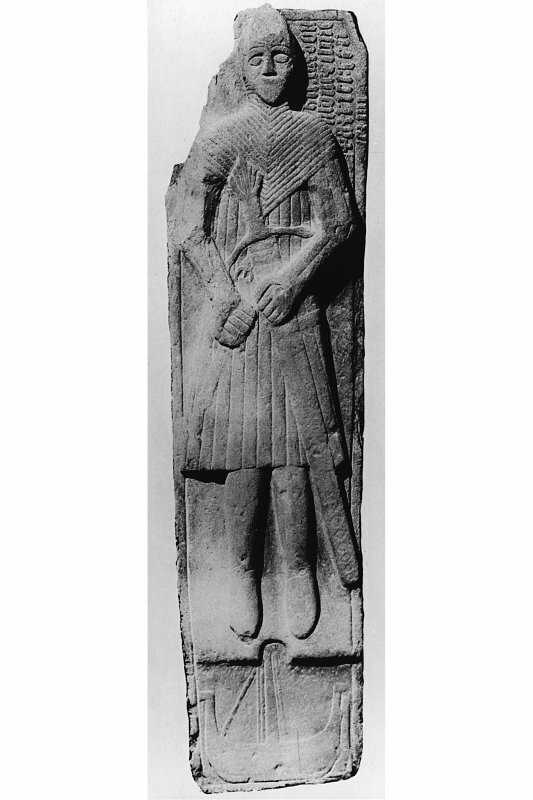 View of effigy of Donaldus, son of Patricius. This 'castle' was the principal court of the Lordship of the Isles. It should more correctly be called a 'palace' as it was not primarily a fortress but a residential mansion, its period of greatest importance being in the reign of John, First Lord (1329-80). The castle measures 5.7 by 4.8m internally; the wall is 0.9m thick and survives almost intact at the gable ends. It lies at the NE end of a complex of much less upstanding buildings and walls that are probably the remains of contemporary structures. However in the vicinity are the turf-covered footings of seven or more rectangular stone built structures which by their random distribution may indicate a later settlement. 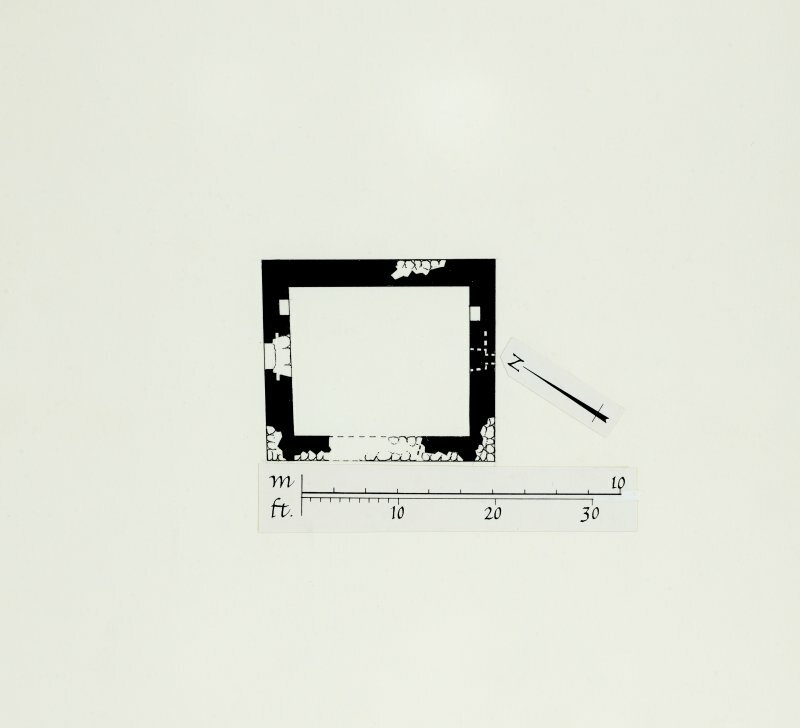 Dimensions range between 7.0 by 5.0m and 9.0 by 6.0m. Sone lazy-bed cultivation is in evidence. Visited by OS (JM), 7 June 1978. 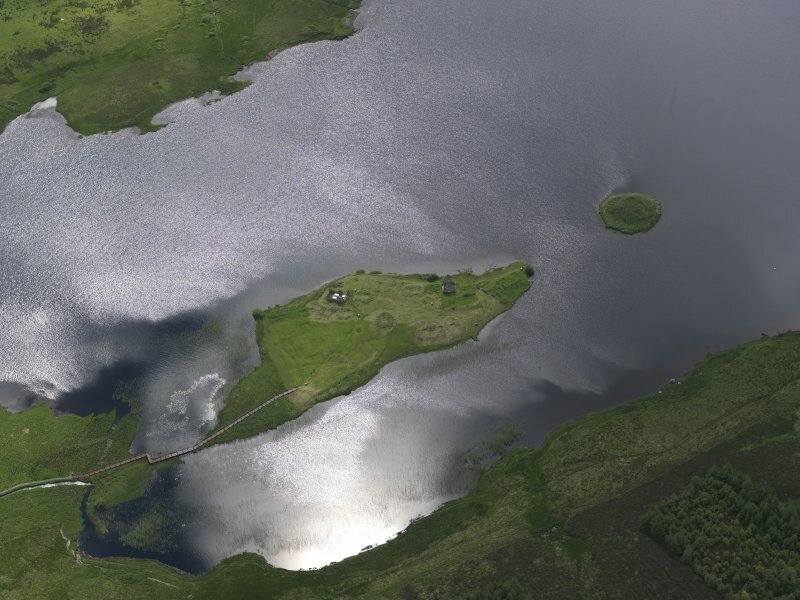 The N tip of the Eilean Mor is separated from the mainland by a narrow reed-grown channel of shallow water. There is no trace of an early causeway at this point, but about 33m to the SW a rough line of large boulders, some 2m in width, can be seen projecting northwards from the NW shore of the island immediately below the surface of the loch. This may be the remains of a causeway. Access to the island may usually have been obtained by boat, however, for a small jetty, roughly constructed of large boulders, runs into the loch from the NW shore of the island about 55m NE of its southern extremity. Pennant and other later writers noted the existence on the mainland shore of a pier, 'and on a stone is cut, A II or Aeneas (Angus) the second, one of the lords of the isles, in whose reign it was founded'. There are now no traces of this pier or of the houses of the MacDonald guards that are supposed to have stood thereabouts. From the jetty a path rises in an easterly direction towards a large, rectangular building (A on Fig.) which appears to be the nucleus of the complex of structures that occupies the SW portion of the island. This building measures 18.6m from NE to SW by 8.8m transversely over walls about 1m in thickness; the masonry is bonded in lime mortar and there is some evidence of the use of yellow sandstone dressings. A stone partition wall, 0.6m in thickness, traverses the building towards its NE end, and incorporates two rebated doorways giving access from the greater room to the lesser; the principal entrance-doorway appears to have been situated in the SE wall a little to the SW of this partition. The plan of this building suggests that it was a hall, with a service area at its NE end. 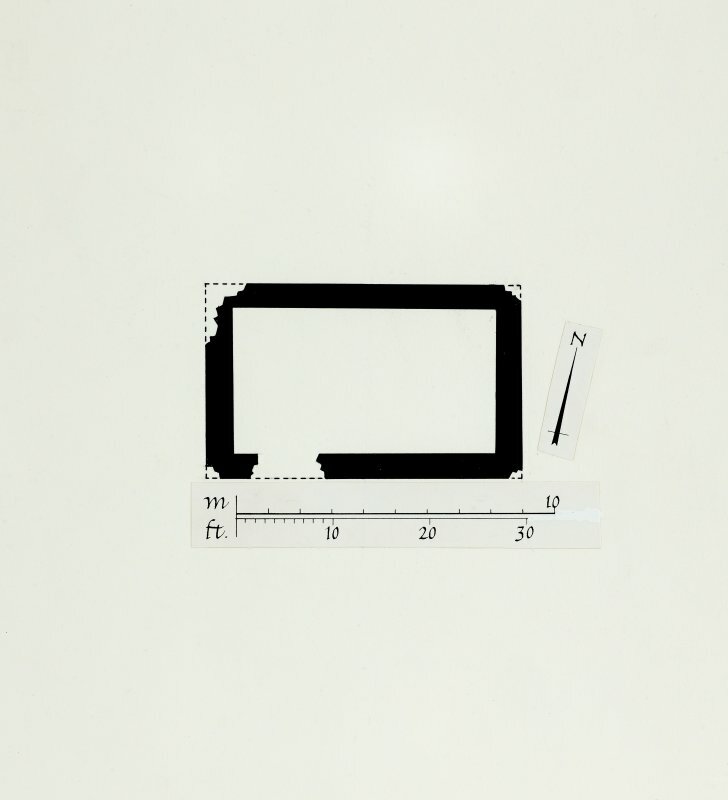 From the SE wall of the hall, but apparently having no direct communication with it, there projects a small rectangular building (B) measuring about 7.6m by 5.5m over all, and having traces of two doorways placed opposite to each other in the side-walls. To the E of building B and running parallel to it there is a relatively well-preserved two-storeyed building (C) whose gable-walls still rise almost their full heights. This measures 7.3m by 6.4m over walls 0.8m in thickness; the masonry, which is of roughly-coursed rubble laid in lime mortar, embodies a number of square putlog-holes in the upper portions of the gable-walls. The steep gable-copings evidently incorporated a number of stones set at right angles to the rake. There is evidence of a doorway and of a window at ground-floor level in the SW wall, while at the same level the NW gable incorporates a service-hatch or low window directly facing the presumed site of the hall doorway. The splayed jambs of this opening are rebated for a frame behind which there is provision for a sliding bar, and the embrasure has a segmental-headed relieving arch. To the NE of this window there is a small aumbry, and there is another in the SE wall. On the upper floor there is a window in the SE gable having provision for a shutter secured by a sliding draw-bar. Its external surround incorporates fragments of red sandstone, these fragments were probably reused from an earlier building. About 0.7m above the lintel of this window there is an external intake-course. There is another small window high up in the NW gable, its lintel coinciding with an internal intake-course which does not correspond in height to the one in the opposite wall. There is evidence neither of a fireplace nor a stair, and access to the upper floor was probably obtained by means of a ladder. The functions of this building and of the neighbouring structures (B) are uncertain, but their proximity to the hall (A) suggests that they were utilised for service purposes. To the NE of building C there are the remains of what appears to have been a passageway (D), beyond which there are two contiguous subrectangular buildings (E, F) of which the larger (F) seems to have had opposed entrance-doorways in the side-walls; to the E there is a small horseshoe-shaped enclosure (F1). Building E appears to be of later date than building F. Immediately to the N of these two buildings there is a terrace which incorporates a small stone-lined depression (G), perhaps a well. The terrace continues eastwards towards a pair of poorly preserved buildings (H, J), of which the former, at least, comprised two rooms. On the N side of the hall, and immediately to the E of the jetty, there are traces of another two subrectangular buildings. The larger (K) measures 11.9m from NE to SW by 7m transversely over all and comprises a single room, while the smaller (L), which runs at right angles to it, evidently comrpised two rooms. To the SW of the hall there is another pair of buildings (M, N), linked together by a short stretch of wall; the larger one (M), which has markedly rounded internal corners, has a wing or annexe on its NW side. 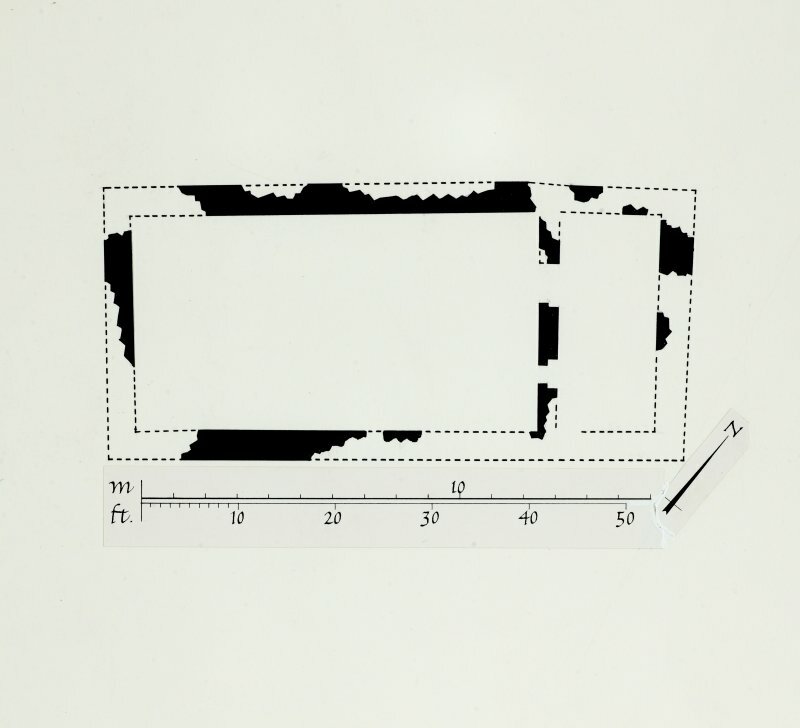 Beyond buidling M, and occupying the SW extremity of the island, there is a rectangular building (P) measuring 11.5m from NE to SW by 6.8m transversely over walls about 0.7m in thickness; the masonry is of rubble lime mortar. The building appears to have comprised two rooms of similar size entered from central passage to which access was gained from an entrance-doorway in the SE wall. Close to the W corner of the building a wall projects NW towards the loch, to form the SW termination of a rough terrace or revetment which runs parallel and adjacent to the NW wall of the main structure. 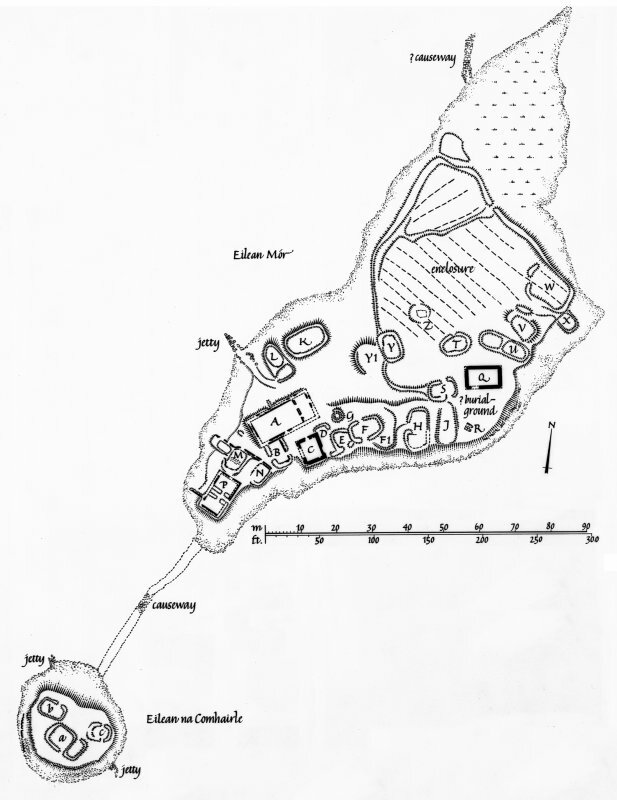 In view both of its position and of its superior construction it is possible that building P, together with its neighbours M and N, constituted the residential quarters of the MacDonald Lords of the Isles. The present condition of the existing remains precludes close dating, but it is probable that most of the buildings described above, including the hall belong to the late medieval period. The status of the domestic buildings on the site after the forfeiture of the Lordship is uncertain. 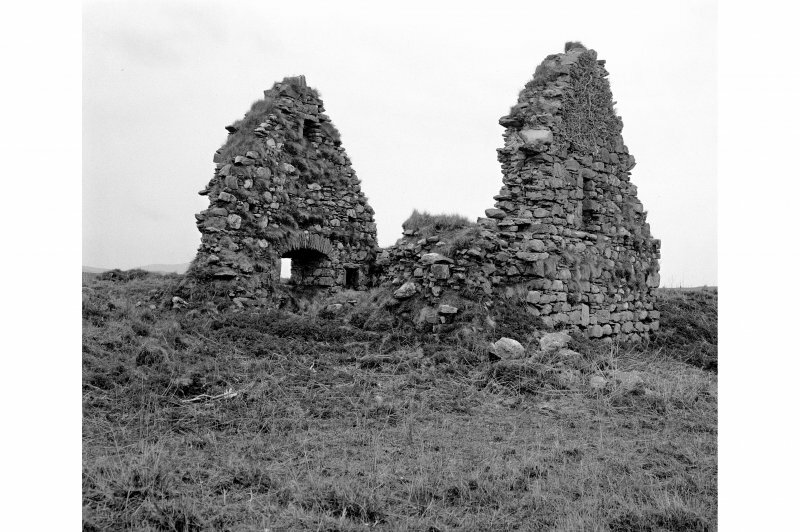 In 1541 Finlaggan and two neighbouring properties were held from the Crown by Donald McIllaspy, probably a member of a well-established local family, but it is not clear from Munro's account of 1549 whether the buildings were occupied, and when Martin visited the site at the end of the following century they were ruinous. Later writers offer little additional decriptive information, and their accounts have recently been summarised by R W Munro, who provides the most complete modern history of the site. RCAHMS 1984, visited May 1981. Work in 1990 was designed to assess the entent and quality of archaeological deposits here and at NR36NE 5. 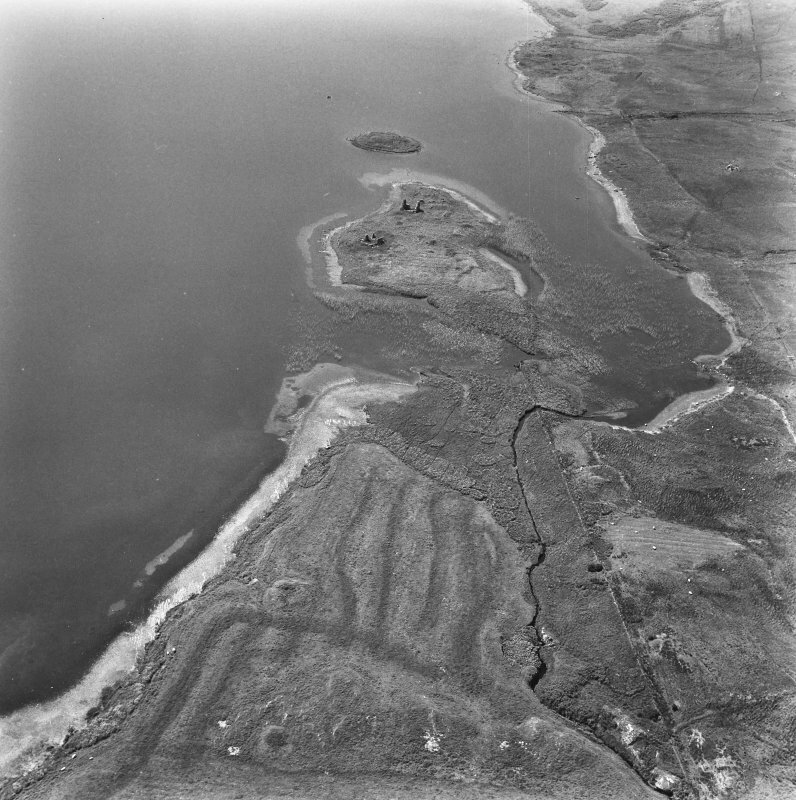 An underwater survey undertaken by John Chesher and Nigel Ruckley of the British Geological Survey established the line of the causeway connecting the island to the lochside. Its stones can be traced rising through a build-up of alluvium at the apex of the enclosure bank where there are the probable ruins of a tower or gatehouse. Off the east side of the island several roof slates and the upper stone from a rotary quern were recovered. Three areas, including NR36NE 5 were excavated. The enclosure bank turned out to be the remains of a complex timber fortification. The only dating evidence was a tiny sherd of medieval pottery. A rectangular dry-stone building labelled K in the RCAHMS account appeared to be a byre or barn of 16th or 17th century date. It overlay earlier deposits with a mill-stone used as the base of an oven or kiln. Apart from the cross-head found at NR36NE 5 and quern, finds included a musical instrument pin and sherds of hand-made and wheel-turned medieval pottery. At least one hand-made vessel was made in imitation of a typical medieval jug. Sponsors: The National Museums of Scotland, The Clan Donald Lands Trust, The Hunter Archaeological Trust, The Russel Trust. 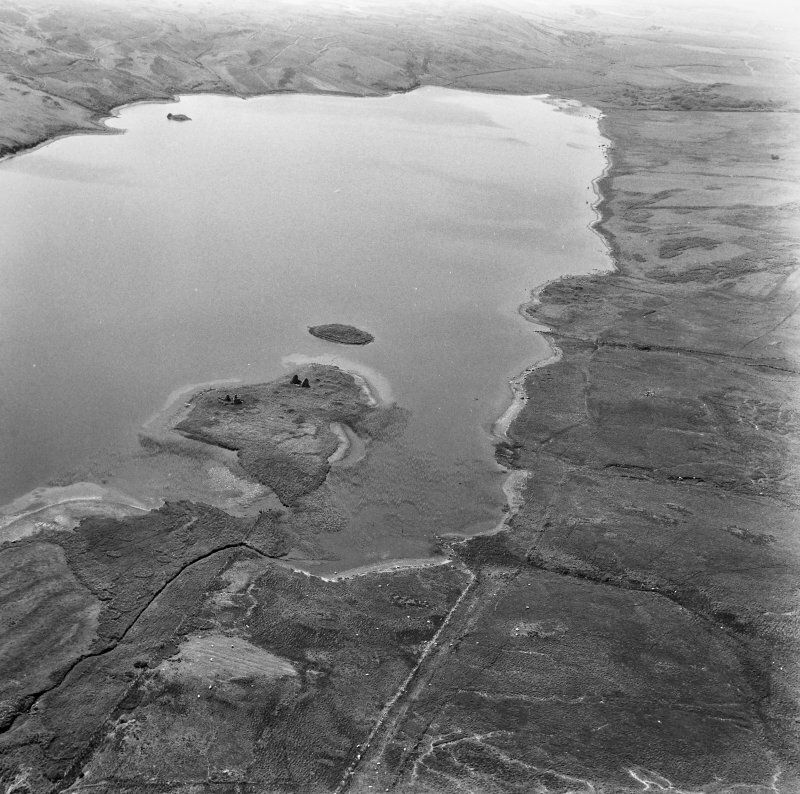 A second season of excavations was undertaken in May and June 1981. Four trenches were excavated. Trenches 2 and 4 examined two adjacent dry stone buildings (L & K), the occupation of which is dated by pottery to the 16th century. L was a simple subrectangular structure extended into a two room building. K was a barn with opposed doors and a storage area behind a cross wall at one end. It overlay medieval deposits dated by pottery to the 15th century, and including the small hearth or oven with a mill-stone base reported last year. In trench 5 the relationship of building P with other structures was explored. 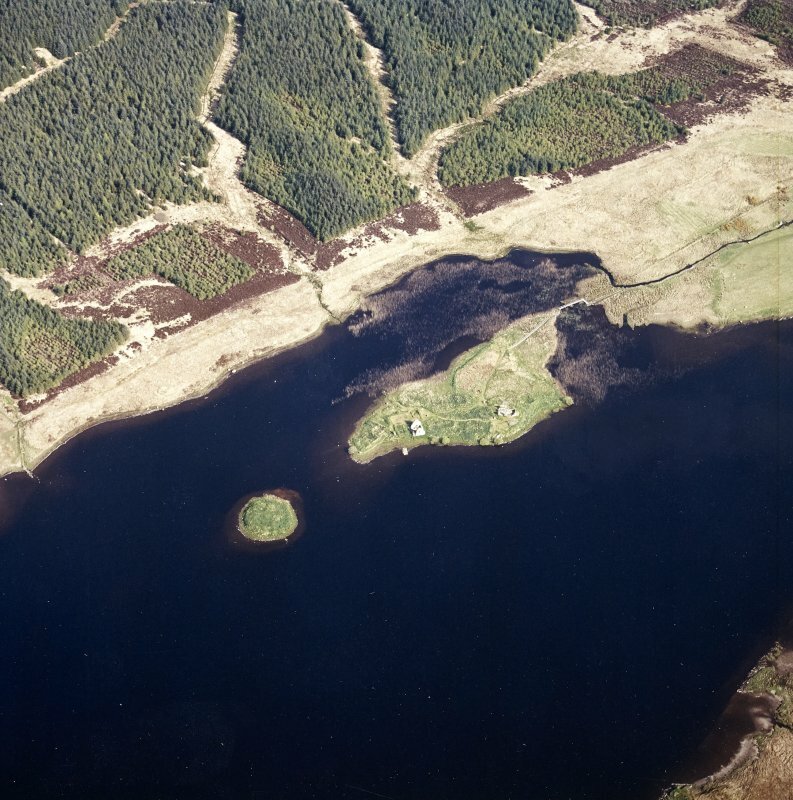 P was a rectangular, lime mortared construction about 11.5m by 6.8m, at the tip of Eilean Mor where a causeway extends to the adjacent artificial Eilean na comhairle (the Council Island). P is thought to have been part of the residential complex of the Lords. The supposed cross walls dividing its interior turned out to belong to two subrectangular dry stone buildings set in its ruins with a third, structure M, built next to it. P itself was founded directly on lochside gravels and had a stone paved terrace along at least two sides. Along the NW side of P this sat on an earlier bank, the remains of a timber-work defence of similar construction to the one sectioned in 1990 at the other end of the island. Trench 6 was positioned near the chapel to cut another stretch of this timberwork fortification, here separated from the spine of the island by a ditch back-filled with midden deposits including 15th century pottery. Perhaps the most interesting discovery this year was elements of a road system consisting of paved causeways wide enough for two abreast. One extended from a jetty on the N side of the island in the direction of the chapel (NR36NE 5). Another branched away from near the jetty in the direction of building P and the Council Island. The end wall of building K was built over another. In trench 6 two type 6 groats of James III (minted c1485) were recovered from a deposit which may reflect the abandonment of this system. Small finds include a plough share built into the structure of building K, and a medieval Jew's harp. The pottery consists of locally hand-built earthenware and several sherds of 15th and 16th century continental wares. There is relatively little wheel-made pot from the Scottish mainland. Sponsors: The National Museums of Scotland, The Clan Donald Lands Trust, The Hunter Archaeological Trust. 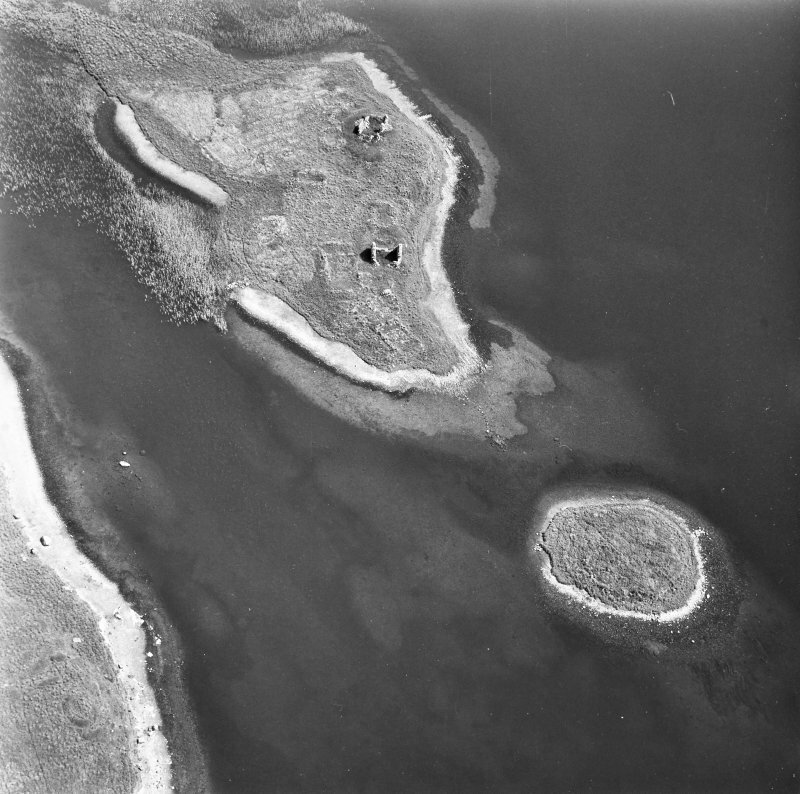 In September 1992, a third season of excavations was undertaken on this island site. Six trenches were excavated. Trench 7 examined structure V, a rectangular building with rounded corners. Its walls were of turf construction faced with stone and its destruction or demolition is dated bya type 6 groat of James III (c1485). It was partially overlaid by a two-roomed, drystone house, structure U, and itself covered timber slots, perhaps for a defensive tower associated with the adjacent palisade, now represented bya low earthen bank defining an enclosure with rig and furrow. A geophysical survey was made of this enclosure to attempt to trace remains of any buildings in use prior to the agricultural activity but the results have still to be fully assessed. In trench 8 another rectangular building, structure H, with stone-faced turf walls was partially excavated. Its ruins saw secondary reuse with a kiln, for corn-drying (? ), probably in the 16th century. There was also a curious spread of animal teeth, yet to be explained. The primary floor deposits will be explored in 1993. Trenches 10 and 11 were positioned to give some understanding of buildings A and B, the former supposed to be the great hall of the Lords, the main public building on the island. It had lime mortared walls with splayed bases and a slate roof. It was substantially remodelled with a cross wall screening off a supposed service area at the E end and a door midway along its S wall with reused jamb mouldings suggestive of a 14th century date. Stone paved roads ran along the E and W sides of the hall and the road from the chapel went past the hall door and under structure N in the direction of the causeway to the neighbouring Council Isle. The hall was totally dismantled in the 16th century and at least one drystone house erected on its site. Building B, a rectangular structure with rounded corners and lime mortared walls was built, utilising part of the S wall of the hall for its own N wall. It has opposed doorways and chaff and other cereal remains have been recovered from its floor surface, suggesting its use as a barn. Along with building C it may have belonged to a family of some status in the 16th century, presumably the MacGilleasbuigs, crown tenants after the downfall of the MacDonalds. Trenches 9 and 12 were designed to examine an area in the centre of the island which seemed to be unencumbered with buildings. This turned out not to be the case with evidence for earth and stone walled structures of the Medieval Period. A section of another palisade was encountered in trench 9. It had been identified by the Royal Commission as part of a small yard Y1 but may rather be part of a much larger enclosure around the western portion of the island. Other supposed pieces of it were picked up last year under buildings P and K.
Evidence is also accumulating that Eilean Mor was artificially extended in area in the Medieval Period. Its original extent may have been little more than the ridge extending from NE of the chapel to the great hall. A build up of sediments and midden deposits N and northwestwards was then consolidated by the erection of palisades set in turf banks, as much a defence against the water as two-legged aggressors. 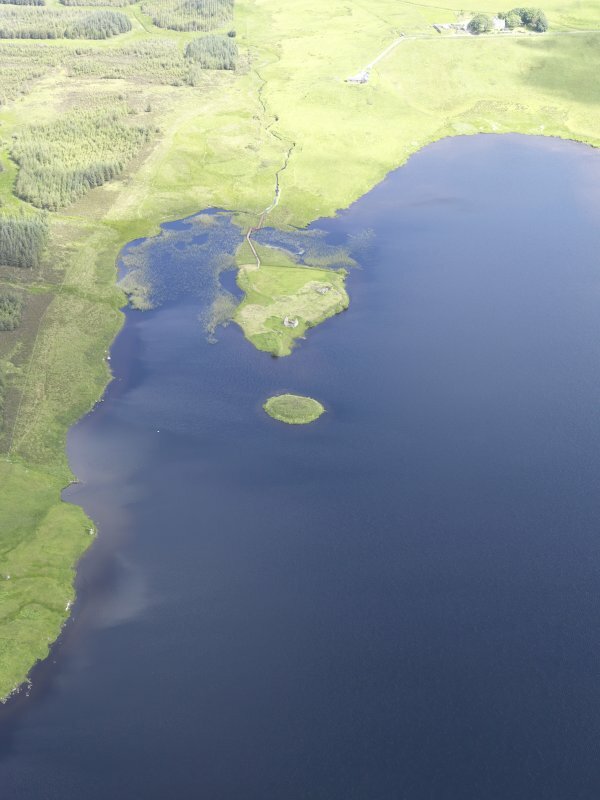 Work also continued on an associated programme of environmental research, one of the main aims of which is to assess the importance, effect and time span of lead ore extraction about Finlaggan. To this end Mike Cressey of Edinburgh University is working on sediment cores taken from Lochs Finlaggan, Lossit, Ballygrant, Bharradail and Leathann. 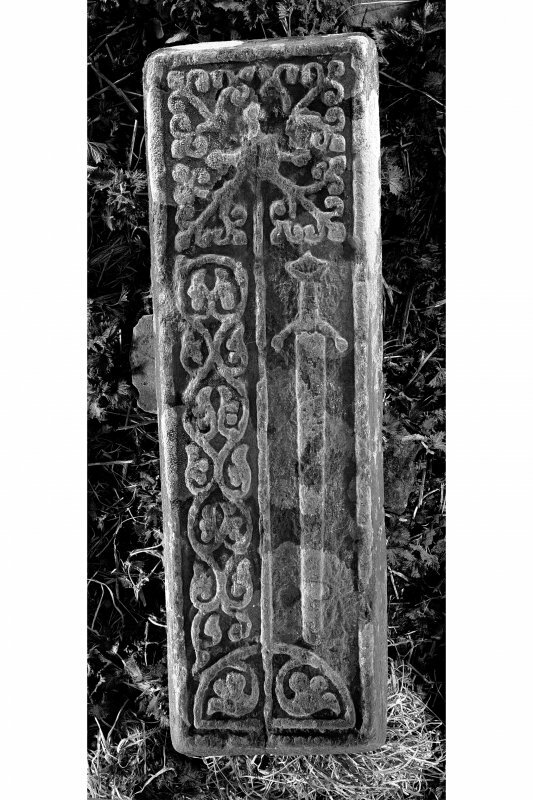 Finds this year included two bone playing pieces, one carved with a deer, the other with interlace, both in West Highland style. A stone corbel in the form of a human head, incorporated in the wall of building B next to its entrance, may originally have been part of the structure of the great hall. Sponsors: The National Museums of Scotland, The Clan Donald Lands Trust, The Hunter Archaeological Trust, The Science and Engineering Research Council. A fourth season of excavations was undertaken in September 1993 at this, the so-called Centre of the Lordship of the Isles. 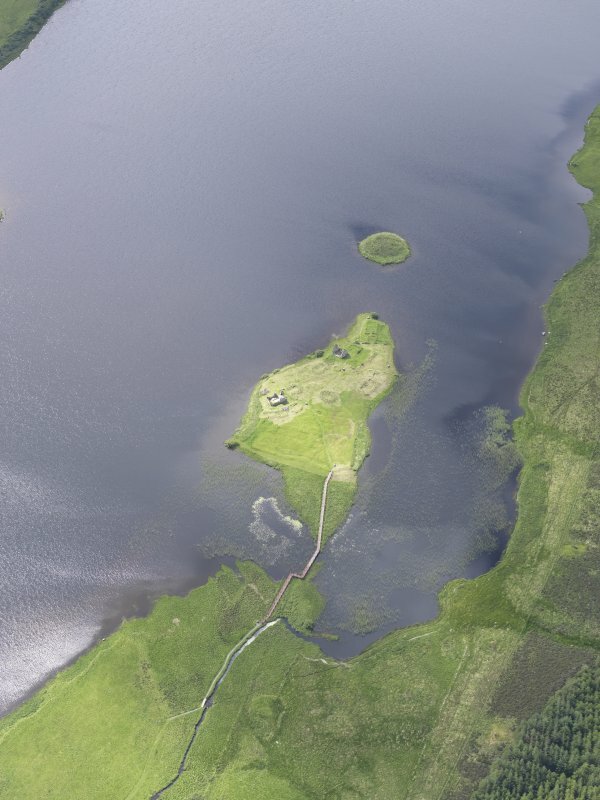 This year, trenches were opened on Eilean na Comhairle (NR36NE 20) as well as Eilean Mor. On Eilean Mor, work was continued on trench 8 on the main spine of the island. Building H, one of a series of rectangular buildings, about 12m by 7m, placed end-on to the paved road from the chapel to the great hall, had walls of drystone construction with an earth or turf cover. Two post holes adjacent to these walls were probably for crucks. A stone-capped drain (interpreted by RCAHMS as a wall) divided the building into two unequal portions. 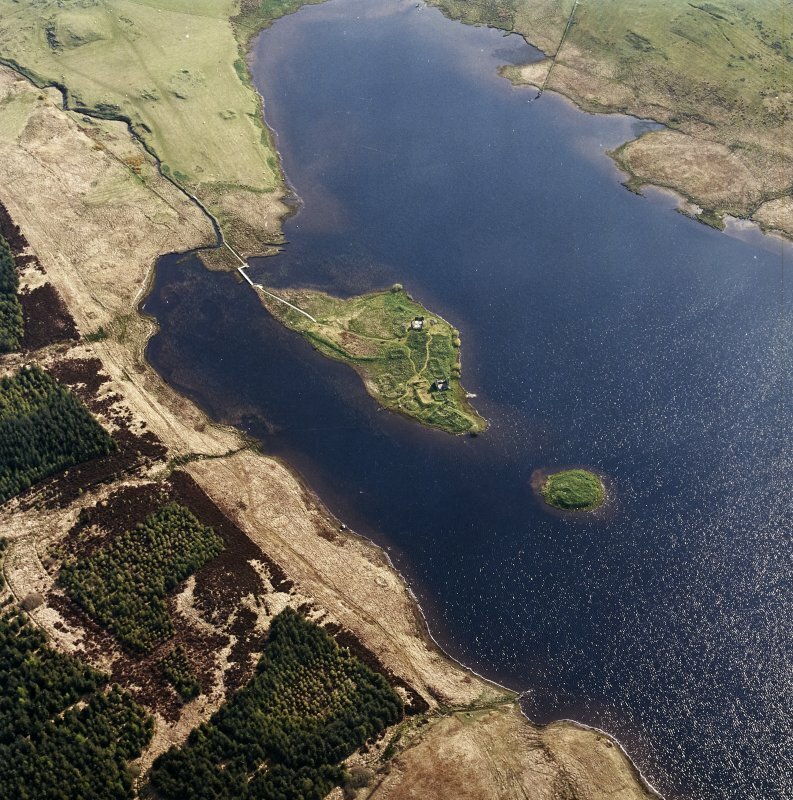 An extension to trench 8 down the side of the island found more evidence for a timberwork defence, thought to have surrounded Eilean Mor in the Mediaeval Period. A greatly enlarged trench 12 in the centre of Eilean Mor examined two adjacent building plots seperated by a paved alley. The one nearer the great hall had a rectangular, lime-mortared stone building superseded by a structure with earth or turf walls faced with stone, with at least one slot for a cruck. The earlier building contained an oven or kiln, probably for food preparation. On the other plot, a barrel-shaped house of timber construction replaced a sub-rectangular house with stone revetted turf walls and a central hearth. Another small trench, 15, anticipated the proposed conservation of the upstanding walls of building C. Again, there was evidence of Victorian clearance and excavation but little light was thrown on the date or function of this structure, thought possibly, in its present form, to be be a 16th-century house of someone of status. Finds from the two islands and around their edges suggest occupation spanned the period from the 13th to the 16th century. Tenuous traces of stake or wattle walls recovered this year in trench 17 and previously in trench 7 may relate to an earlier period, but although the stratigraphic evidence for all trenches is good, there is a lack of precise dating information. 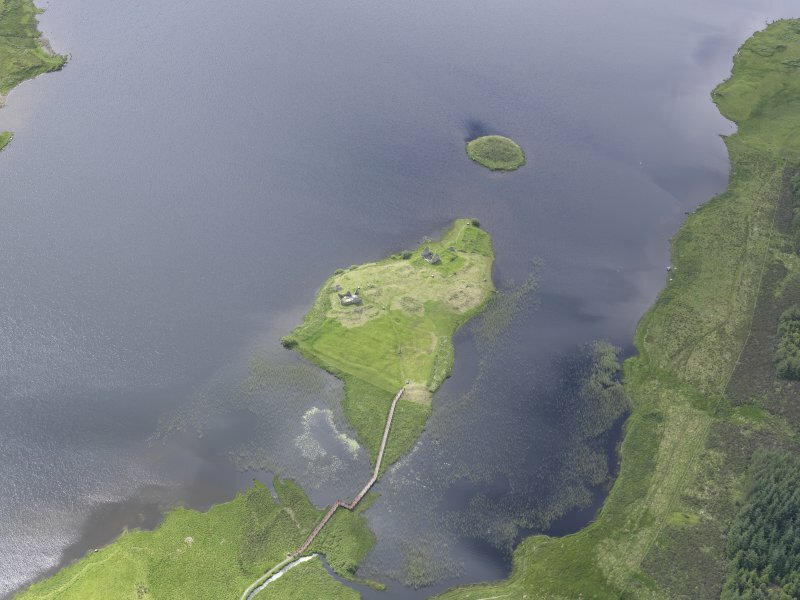 The picture that is emerging of Finlaggan in the Middle Ages is of a castle on a small island, adjacent to a larger island with over twenty buildings, including a hall and a chapel within timberwork defences. 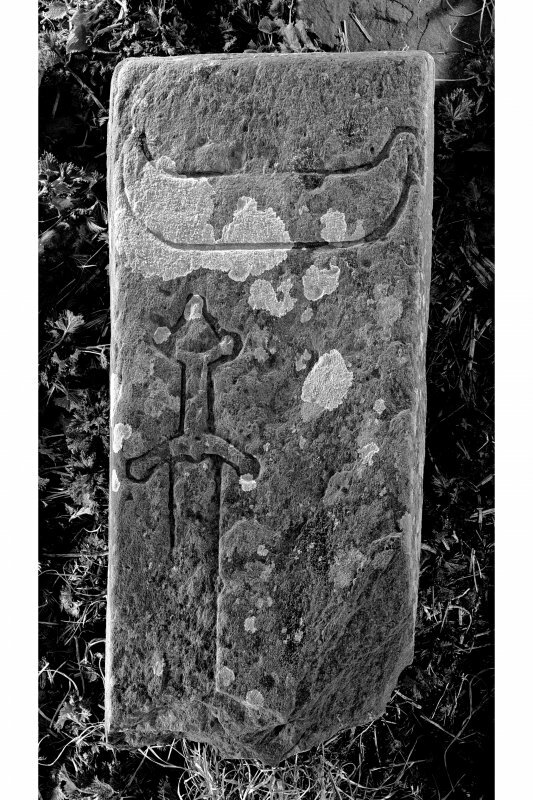 This confirms Finlaggan's importance as the centre of the Lordship of the Isles. Sponsors: NMS, The Glencoe Foundation, The Hunter Trust, The Russell Tru Trust. The fifth season of excavation on this island took place over a period of twelve weeks from 6 June to 26 August 1994. 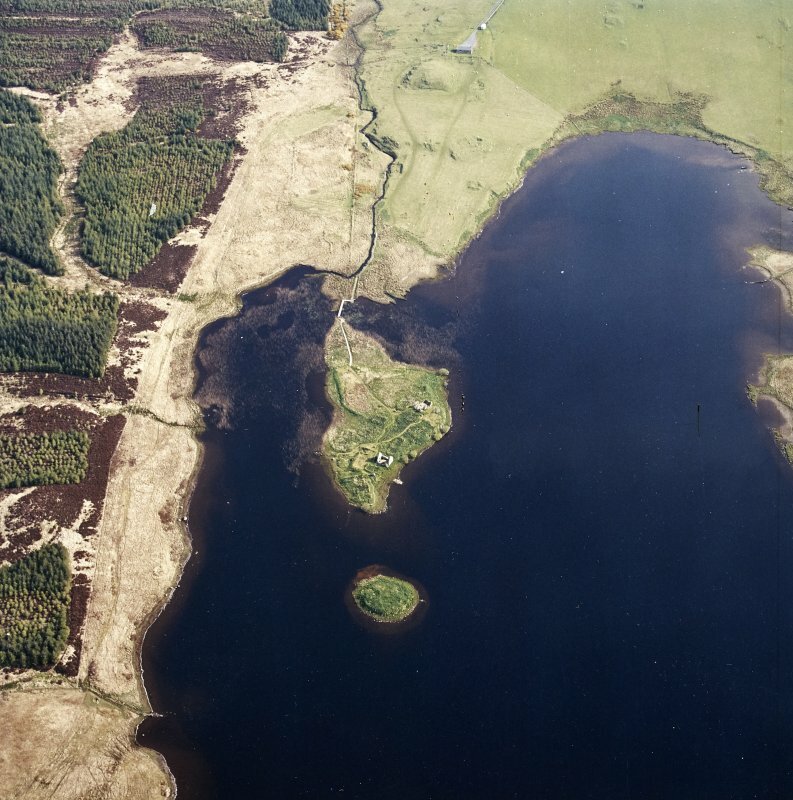 Trench 18, 4m by 8m, at the apex of the island was to examine the relationship of a causeway from the loch shore to the medieval timberwork defence around the island. The stones stopped short of the hmberwork but two alignments of boulders may have supported a wooden continuation in the Post-Medieval Period. The low mound exterior to the dmberwork defence was expected to reveal remains of a medieval tower or entrance gate. There were tenuous traces of a medieval turf bank over a ploughed surface. The core of the mound consisted of redeposited sand containing numerous flint flakes and small pieces of bone. Beyond the mound a stone-lined tank, about 0.5m by 1.5m, was found slotted into a ditch. It possibly served as a fish-holding tank. Trench 19, with an area of 1 16 sq m, was laid out on the slope to the N of the chapel and building T. Post-medieval lazy-beds had largely destroyed the remains of at least one medieval building, represented by a scatter of stones, sherds of pot and nails, and truncated post holes. Other pits, some associated with crude handmade potsherds, may be a palimpsest of pre-medieval structures. NR 3883 6811 Building C is a small rectangular structure, 7.3 x 6.4m, its N and S gable walls standing almost complete. It has a ground-floor chamber and an upper storey contained in the roof space. The walls, of coursed random rubble in lime mortar, are obviously of more than one build. In its final form it is thought to be post-medieval in date, and to have been a dwelling-house for someone of some status locally - perhaps Donald MacGillespie, crown tenant of Portaneilean (Finlaggan) in the 1540s. There was limited excavation in 1993 in the interior in anticipation of conservation work on the walls, and in 1997 a watching brief was undertaken while rubble around the walls was removed so that this work could proceed. It appeared that the earth floor(s) of the building had been dug out in previous unrecorded excavations, leaving only a make-up deposit of sandy, silty clay. This had had a trench partially sunk through it by the earlier diggers, and from material they had disturbed was recovered a penny imitating one of Edward I of England, class 9b, minted in London in 1299-1301. This coin can be assumed to have been lost prior to the end of the 14th century and can be considered, with due caution, to provide a date for the construction of the building. In the course of cleaning the walls, horizontal beam slots were found in the gables at the level of the wall heads, extending inwards from the E for an unknown distance. Along with put-log holes in the lower gable walls these belong to the building's medieval phase and may be evidence for an upper storey projecting out over the lower walls. Perhaps Building C was originally constructed as the solar tower for the adjacent great hall, to which it could have been connected at an upper level. Sponsors: National Museums of Scotland, Russell Trust, Schroder Charity Trust, The Army, Society of Antiquaries of Scotland.